The test is a valid measure for performance in soccer. The same can’t be said for other tests of fitness. The test had a high reproducibility and sensitivity, allowing for detailed analysis of the physical capacity of athletes in intermittent sports. Specifically, the Yo-Yo intermittent recovery test was a valid measure of fitness performance in soccer. During the test, the aerobic loading approached maximal values, and the anaerobic energy system was highly taxed. Additionally, the study suggests that fatigue during intense intermittent short-term exercise was unrelated to muscle CP, lactate, pH, and glycogen. Why do I prefer YoYo IR2 over YoYo IR1? The Yo-Yo IR level 1 (Yo-Yo IR1) test focuses on the capacity to carry out intermittent exercise leading to a maximal activation of the aerobic system, whereas Yo-Yo IR level 2 (Yo-Yo IR2) determines an individual’s ability to recover from repeated exercise with a high contribution from the anaerobic system. The elite game, while still hugely aerobic, has a significantly higher intermittent anaerobic component than at lower levels of the sport. Why is it more appropriate as a measure for performance in ELITE soccer? This study demonstrates that the Yo-Yo IR2 test is reproducible and can be used to evaluate an athlete’s ability to perform intense intermittent exercise with a high rate of aerobic and anaerobic energy turnover. Specifically, the Yo-Yo IR2 test was shown to be a sensitive tool to differentiate between intermittent exercise performance of soccer players in different seasonal periods and at different competitive levels and playing positions. In addition to these points there is quite a bit of normative data on players across different levels of the sport which I think is important since I am making test selections not just for our first team but also our youth Academy teams and the goal is to have all players using the same test measures since the goal is to get as many as possible to the elite level. I’m curious to hear choice selections from other fitness coaches so please post thoughts to comments. I use Yo-Yo IE2 and IR2. The game is faster since 2004, but aerobic power often indicative of recoverability from high intensity sprints. Thanks for the article. It is helpful. I am planning on doing the Yo-Yo IE2 with my D3 College soccer team. I had run it in the past but have never really looked at normative data. Do you have any recommendations on what are good benchmarks for total meters run for a team and or by positions? There is some additional research on the topic if you look at pubmed. Most of the research has been on the IR2 but there’s quite a bit on the IE2 as well. Thanks for the article Mike. What do you recommend for basketball players: IR1 or IR2? I think both are suitable for varying reasons. IR1 might be the better fit though. I have used the IR1 & IR2, I’ve found that IR2 speed can be too fast for some U16 players, and to compare data as they go from U10-U18 it’s valuable to do the same test to track what the changes are between year to year. 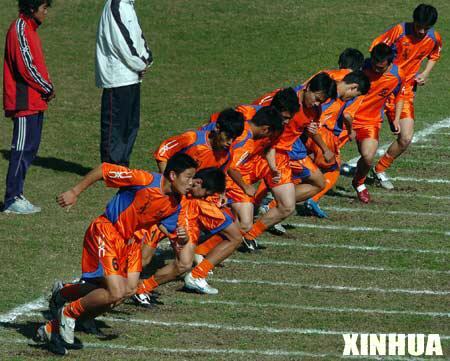 It still amazes me when I see some teams using Beep Test when there is minimal specificity to Soccer. You are doing a good job with it. Are you familiar with the RAST Running Based, Anaerobic, Sprint Test ? It is a good test used by some Clubs in Europe and back home in Brasil. It seems to be a good and specific test for soccer, specially since it takes the players, weight in consideration and the results are for each player is more individualized.We were also thinking.Why it is not as popular, and more teams are not using? What you think about this test? You are doing a very good job with it. I’m familiar with the test and think it’s quite good. As with anything new, it takes time to unseat established protocols. I think we’ve just really started to see the YoYo tests replace the Bleep tests as the standard fitness protocol for soccer even after quite a bit of research supporting it. So it might be a while before RAST or anything else unseats it. Hello, I have two questions, first, which is more difficult, the IR1 or IR2, and second, which is most suitable for a college soccer player? thank you. IR1 is typically reserved for females and IR2 is typically reserved for males. One isn’t really ‘harder’ than the other. They’re just slightly different tests. There are also IE1 and IE2 versions. For a college soccer player I would use the IR1 & IR2 depending on the gender.